If you see someone behaving strangely in your local supermarket, don’t panic, it’s probably one of us. During Peter Golding’s talk on Practical Dowsing Training on Saturday 23rd July, we learned that dowsing can be useful for finding out whether certain foods or products are good for us (or not). Using either a pendulum or even just dangling an arm and seeing which way it swings, can give us valuable clues. If you’ve ever said you felt something with every fibre of your being, you weren’t far wrong. Peter quoted author Elizabeth Brown’s book, ‘Dowsing’, which claims recent scientific research indicates that the key is in the micro-structures and fibres of each and every cell, not just in the brain but in the entire body. 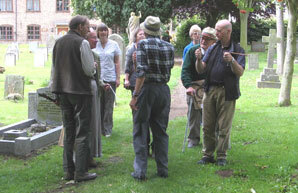 Slimbridge Dowsing Group dowsing for energy spirals in Slimbridge churchyard. After reassuring us that dowsing truly is just a matter of practice and confidence, Peter took us outside to find a water pipe between the village hall and the road, and then an electric cable. Knowing such utilities are usually buried underground, we all concentrated hard, formed a line and were delighted when everyone’s rods crossed at the same time. “Now look up.” instructed Peter, and there above us was the electricity cable in question! After that we crossed the road to the churchyard and into the Glebe field (with the farmer’s permission) to find the route of the underground sewer outlet pipe from the rectory next door, the outline of a long lost stable building, and for a group hug in our favourite energy spiral in the far corner of the field, which is always there and always uplifting.